I prefer Terry Pratchetts take on it. A cat in a box can be in one of three states. Dead, alive, and bloody furious. I think I managed to get a picture of our cat in that third state, looking at it. 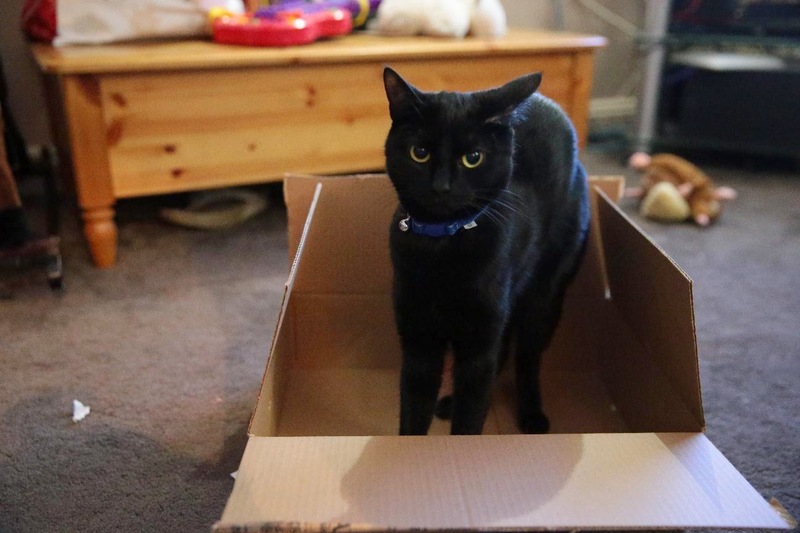 It was "quick, I need a cat in a box for my blog post"... Even so, she stayed in the box for the next hour just for the hell of it. I used to merely dislike cats, partly because they set my asthma off. Now I hate them, because for the last ten years all the cats in the area have been crapping in my garden. It stinks to high heaven and it's disgusting to clean up. The onus should be on cat owners to stop their pets crapping all over the place. I don't care how this is a achieved, keep them in doors all the time for all I care. Also I have a bird table which the cats stalk looking for a meal. There are quite simply far too many cats in the UK. Too many cats, and too few suitable boxes. Science budgetary cuts, no doubt. It's interesting how literally some took his analogy, back in the day. I wonder how many commonly known animals could have been used instead. Chickens are too noisy, obviously. Most people don't understand that Schrödinger's intention was to ridicule this interpretation. The "experiment" with the cat seems ludicrous because it is ludicrous and Schrödinger intends a sympathetic audience to conclude that something else less silly must happen instead of the "super-position" concept, but instead today most people seem to think that this ludicrous experiment is something that really works or at least that all physicists are confident it could work. It's as if the general public had come to believe that Banach-Tarski means they really can turn one orange into two oranges just by some clever manipulation of the orange segments.